The pair describe their appointments as a "thrilling opportunity"
Bristol Old Vic has appointed Tom Morris as its new artistic director and Emma Stenning as executive director. Mr Morris is an associate director at the National Theatre while Ms Stenning is head of producing at the Manchester International Festival. The pair last worked together as artistic and executive directors at the Battersea Arts Centre. A public meeting will be held on 16 April to introduce the new appointees to the city and hear their plans. In a joint statement the pair said: "We are delighted to join the Bristol Old Vic at this unique moment in its history. "Bristol has the most exquisite 18th Century playhouse in the country in an extraordinary, flexible and under-used building. "The opportunity to rediscover the potential of this globally celebrated theatre in partnership with the people of Bristol is thrilling." The theatre, which closed for 18 months from August 2007 for a refit, had been struggling financially, with upgrade costs rising from £7m to £9m. Before the refit Simon Read was the artistic director and Rebecca Morland the executive director. Both chose to move on when the theatre closed. The Arts Council made a grant of £2m towards its ongoing refurbishment costs and, in a separate process, the theatre won £578,000 towards its development. A fund-raising campaign was launched to make up the shortfall. 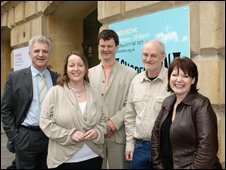 The theatre reopened with a children's show in December 2008 and has since announced a full programme, including Catherine Johnson's new play Suspension which is due to open on 27 February. Plays have been performed at the Old Vic site since 1766.